We have posted and placed on sale a variety of products from several categories. Some are Soldier and War designs, some are products from our suppliers, and some are discontinued items from our suppliers. All on sale items are listed the home page under “Featured Products On Sale”. We are expanding into the motorcycle theme products both on the web and at shows. I have been posting these products for several weeks. I will be placing some of these on sale before the June Air shows. Some of these products are classic ladies designs. Watch for this posting. We will be reprinting the US25 Ranger and the US40 Airborne Tee’s. They will be on sale at $16.00 until the end of February. Hoodies of the same design will be available at $31.00 by pre order only. I have created the necessary information to pre order either hoodie, and posted it on the home page featured section, without photos. The t-shirt image is also posted for you to be able to review the design. I can truly say I have never sent an e-mail blast like this one, and I hope I never have to send another one. In any business there will be unforeseen expenses. I have had several in the last eight years, and have managed to overcome them without raising prices. The 2018 Indiana State legislature passed the internet sales tax for all sales. This is one expense I cannot overcome. It will be necessary to raise all items by $1.00. It will take me several weeks to reprogram the web. You will be able to shop at the old prices until the reprograming is done. 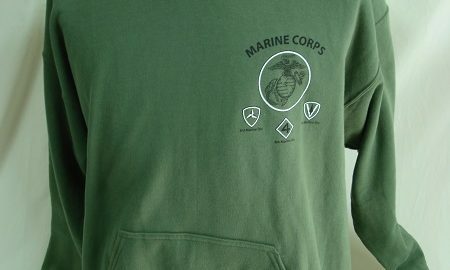 We have added many new designs for modern American military shirts as well as several in the Novelty category. We have posted the eight new designs we have produced this year. The four German and the four American are revised original Soldier and War designs. They are on sale until January 1st 2019. Single sided prints m-xl are $18.00 2x and 3x are $20.00. The two sided prints G26-2 and G26-6 are $22.00 m-xl and $24.00 2x and 3x. All eight shirts are on the featured page. The subject of this e-mail is new design for our Stug Assault Gun T-Shirt. The original item Code was G26. We now have two G26-6 in the color Grey, and G26-2 in the color Forrest Green. The original was a single sided print only. I was never satisfied with the original image, and that is why this new shirt is now available. I have improved the artwork for the front image and added historical information for a new back image. These shirts can be viewed in the featured section of the home page. The two new G35 shirts that we made available earlier this year, The Desert Storm, and The Enduring Freedom shirts are also featured. I did not print in small or 4x, and only have one each in medium. If we receive sufficient orders I will reprint all sizes and have them to you by Christmas. E-mail me with your preference on size and color. I have poster five new shirts. The “Enduring Freedom” “Heavy Metal”, and “Desert Storm” shirts are all US Military. “Aces Up” and “Liquor Up Front” are poker shirts from our expanded categories. All of these designs use excellent artwork and colors. I will be posting additional item in a few weeks. Soldier And War will be at the Findlay Military Show in Findlay, Ohio. Show dates are Friday May 18th, Saturday May 19th, and Sunday May 20th. This show is located at the Fair Grounds in the eastern part of Findlay. Our display will be located at the North end of building E.
We will be posting motorcycle apparel in the featured section by June 15th. Very high quality women’s apparel. Watch for this posting. Two subjects for this news letter. We have posted the new Modern American Military t-shirts on the featured section of the web. These thirteen are the ones I will carry for the time being. We have also posted the G35 German Eagle in two new colors. The original Soldier and War design was in a light green only. It has been a popular design, and now it is available in Black and Forrest green. Both have been posted in the featured section.